Ocean Isle Beach is one of the most beautiful and unique islands off the coast of North Carolina. It is one of the South Brunswick Islands which were named by Money magazine in 2001 as one of the top ten most beautiful and best places to vacation in the United States. Ocean Isle Beach is six miles long with powder-white sand, sun-danced waves, and windswept marshlands. Driving times from Virginia and Northern cities to Ocean Isle Beach are as close as or closer than the Outer Banks due to the convenient access and reduced traffic. It is a family-oriented, relaxed pace of life style, quiet, non-commercialized, beautiful beach. There are twelve golf courses and numerous restaurants within ten miles and hundreds within 50 miles. Ocean Isle Beach offers huge advantages over the Northern Outer Banks with much warmer water and a wide gently sloping beach perfect for children and adults to play and swim. It also offers huge advantages over the Myrtle Beach area because it is not congested and commercialized. It is the perfect place for vacationers and families who want to relax and enjoy a quiet, peaceful, stress-free vacation adults and children will just love. There is a reason families have returned to Ocean Isle Beach every year for over 40 years. 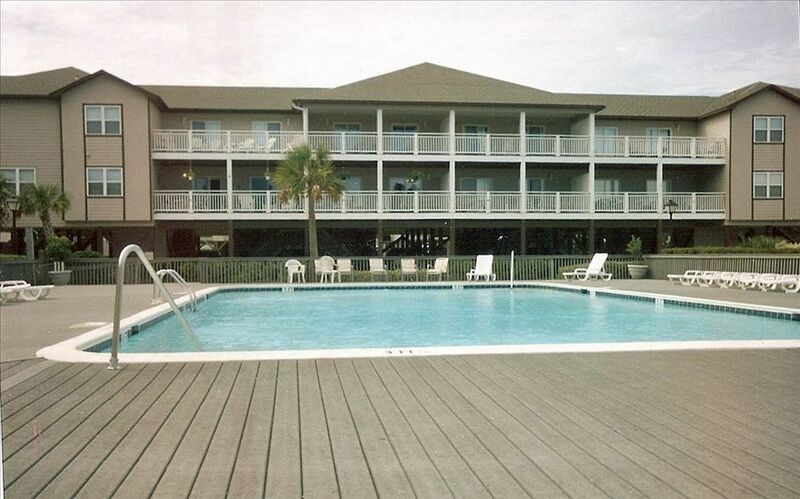 Our Windjammer II Unit EE is one of only eight units in this handsome, two-level building which is located on the West End of Ocean Isle Beach. You will love the large pool located directly in front of this recently built unit! While it is not ocean view you are just a few steps and less than a one-minute walk to the beach and NO streets to cross. It is very large and spacious with over 2300 square feet of interior space plus two large porches which overlook the pool and cabana area. You are not and do not feel cramped in this home and it is much larger than most of the cottages and other condominiums on Ocean Isle and other beaches. The kitchen is spacious with a large capacity refrigerator, large microwave, two coffee makers, tile floors, and lots of cabinet space. WIRELESS BROADBAND INTERNET ACCESS IS INCLUDED! The dining and family living area is tiled with area rugs and has lots of seating with a Cable TV and VCR. The six bedrooms and four bathrooms are spacious and have plenty of closet and storage space. Each bedroom has cable TV. The bedrooms have beds as follows: 1 KING, 1 QUEEN, 1 QUEEN, 1 QUEEN, 2 DOUBLES, 2 DOUBLES. The Master Bedroom is on first level and has a private bath. Two of the six bedrooms and two baths are on the first level and the second level has four bedrooms and two baths. Two of the four bedrooms on the second level have a large porch which overlooks the pool and sundeck area. Two wide covered porches, one on each floor, overlook the spacious pool and sundeck and provide morning sun, but welcome the shade in the afternoon. You can sit in your rocking chair and enjoy the sights at the pool while reading a good book. The walk to the beach is less than a minute, and there is a large deck on the beautiful beach you can sit on or put your beach chairs on the beach and watch the world go by. The beach is just beautiful and is great to play on or stroll down to the inlet and watch the boats come in after a day of fishing or watch the incredible sunsets. The beach is not crowded and you have lots of room to play and walk. There is very limited commercial activity on Ocean Isle but there is a mini golf course, arcade, and ice cream parlor which families have enjoyed together for years. Half a dozen restaurants provide a varied menu for eating out, and there is a pizza parlor on the island. There is a private locked storage room in the carport area which you can use for your beach toys, fishing gear, etc., and the covered carport has room for three cars plus there is plenty of excess parking near the building. Available for weekly rental June through August, Saturday to Saturday, and weekly and daily (three-night minimum) other months. SORRY, pets are NOT allowed, but can be boarded nearby and SMOKING is NOT permitted inside the unit. Peak weeks are high demand. Fall and spring weather is usually great.